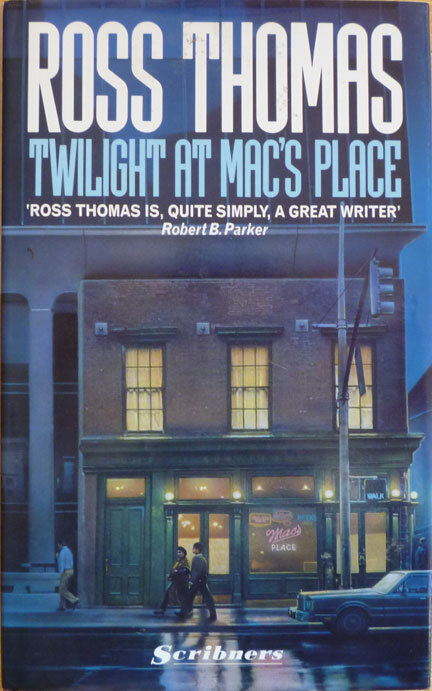 A UK hardback first edition of Twilight at Mac's Place, published by Scribners in 1991 (originally published in the States by Simon & Schuster in 1990). This is the fourth and final book to focus on Mac McCorkle and Mike Padillo, following 1966's The Cold War Swap (published, as we've established, as Spy in the Vodka in the UK in 1967), 1967's Cast a Yellow Shadow (published in the UK in '68), and 1971's The Backup Men. This one's a little different, however: while McCorkle and Padillo do feature, to a greater extent the spotlight follows a new character, a homicide detective turned actor called Granville Haynes, who's offered $100,000, sight unseen, for the memoirs of his recently deceased father, veteran CIA man Steadfast Haynes. 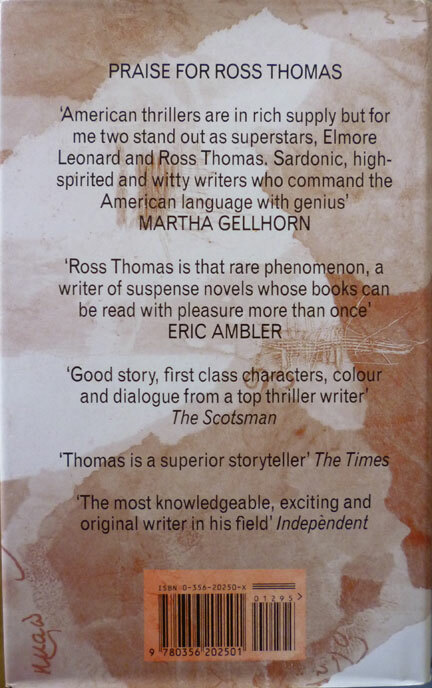 As you'd expect from a Ross Thomas novel, intrigue, treachery and murder follow. And there's another change from the previous three books in the series: Twilight at Mac's Place is written in the third person instead of the first person. 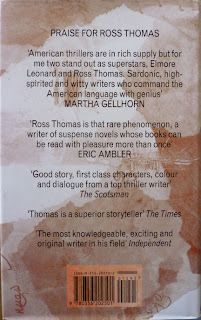 I think Thomas wrote in both manners throughout his career (correct me if I'm wrong, Book Glutton), but it is common for authors to write their early books in the first person and then switch to third person for later books. Some of the authors I'm interested in spring instantly to mind: George Pelecanos, Dennis Lehane, Gavin Lyall (although not Kingsley Amis, who switched back and forth)... And having done a fair bit of writing myself – not novels, but countless magazine articles and reviews – and edited both non-fiction and fiction, I have to say I do find it a lot easier to witter on in the first person on this blog than I have writing from a more elevated, removed perspective in the past. Bit of a stretch, I know – Christ knows I'm no Lyall or Lehane – but there might be a vague comparison there. Maybe. In any case, for fiction writers it's probably something to do with finding their early voice through a version of their own voice – the first person – before gaining the confidence to adopt a more omniscient approach. 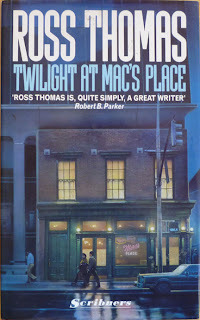 The front cover illustration on the dustjacket of this UK edition of Twilight at Mac's Place is by Stan Watts, whose photorealistic paintings have adorned, among other things, albums by Jeff Beck and Suicidal Tendencies and Harry Turtledove's Worldwar series of books. The back cover textures are credited to Elaine Cox... which, if regular readers cast their minds back, was how I knew the identical uncredited textures on the back of Voodoo Ltd. were also by Elaine Cox. Y'see? It all connects up eventually. I might be barking up the wrong tree here, but I believe Elaine is a painter and jeweller whose work is inspired by landscape; there are lots of examples of her mysterious, evocative multimedia paintings and stylish jewellery at her website. Assuming I've got the right Elaine Cox, that is. If not, what the hell: consider it a free plug.